Today, is the auspicious festival of Ram Navami and we bring you some amazing unknown facts about Lord Rama that you should not miss at all. They will disclose some hidden chapters of Lord Rama’s life. So, know your lord more closely after reading them. Lord Rama was born in the day of Ram Navmi. Lord Rama is the seventh Avatar of Lord Vishnu and the son of King Dasaratha and Queen Kausalya of kingdom Ayodhya. There is still more to know about this auspicious festival, click here to know about it in detail: Ram Navami 2015. Ramayana is one of the most famous epics of Hindus. 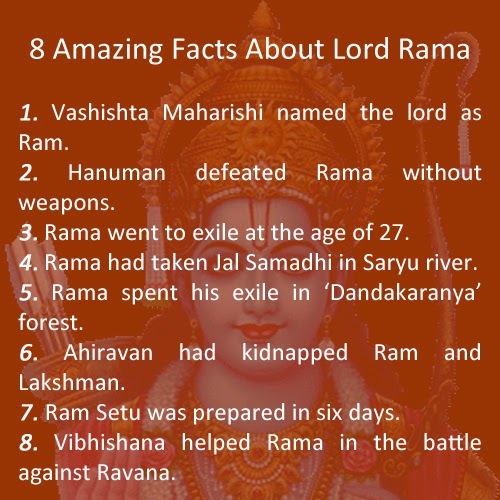 But, there are some interesting facts about Lord Rama which are still unknown to most of the people. What if we disclose those facts on this special occasion of Lord Ram’s birthday? 1. Do you know who named Lord Rama? The Guru of Raghu dynasty, Vashishta Maharishi blessed the lord with the name ‘Rama’. He explained that this divine word is made from two Beejaksharas: Agni Beej and Amrutha Beej. These Aksharas energise the body, mind, and soul. 2. Do you that who defeated Lord Rama in a battle without using any weapon? Lord Hanuman fought against Lord Rama to save Yayati. Lord Rama came to kill Yayati, as ordered by sage Vikramaditya. Hanuman helped Yayati in winning the battle by chanting the name of Lord Rama in the battle field. The arrows of Lord Rama did not have any affect on Lord Hanuman and thus, he (Lord Rama) gave up. 3. Do you know at which age Lord Rama went to exile? At the age of 27 years only. 4. Do you know that how and where Lord Rama left his body for the journey toward his heavenly abode? Lord Rama had taken Jal Samadhi in the river 'Saryu'. He did that when Mata Sita buried herself into the mother earth after giving numerous tests for proving her innocence. 5. Do you know the name of the forest where Lord Rama, Mata Sita and Lakshman had spent their exile? The name of the forest where Lord Rama spent his exile years is ‘Dandakaranya’. This forest is spreaded across the regions of Orissa, Chhattisgarh, Andhra Pradesh, and Maharashtra with an area of about 36, 500 square miles. 6. Do you know who kidnapped Lord Rama? Ahiravana, brother of Ravana kidnapped the two brothers and took them to inferno for sacrificing their lives as an offering to Goddess Mahamaya. But, Lord Hanuman saved their lives by killing Ahiravana. 7. Do you know the length of the bridge, Ram Setu and how many days were spent on constructing it over the sea with limestone shoals? Ram Setu was built by Vanar Sena (army of monkeys - followers of Lord Ram) from Rameswaram island of Tamil Nadu to Mannar island of Sri Lanka. The bridge was approximately 30 kms long and took a total of six days to construct. 8. Do you know who helped Lord Rama to understand the black magic and powers of Ravana in the battle of the two? Vibhishana, the younger brother of Ravana helped Ram to conquer the battle by understanding his powers, magic, and tricks. Lord Rama showed the right way of leading life to humans, he created the ideals to be followed in life. Ram Navami is the day to recall and adopt them in life. So, follow the noble virtues of Lord Ram and get his divine blessings. 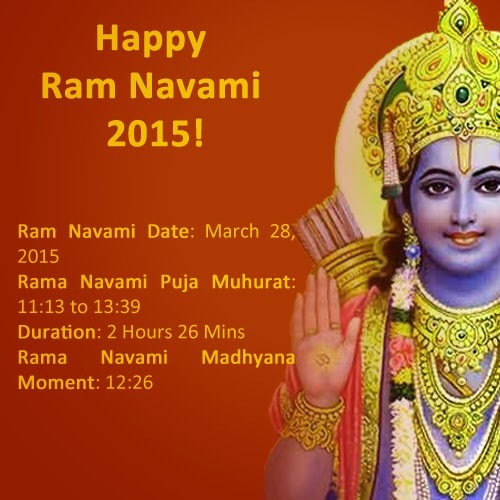 AstroSage wishes you a very happy Ram Navami 2015!!! Today is Swaminarayan Jayanti. Swaminarayan is believed to be the incarnation of Lord Vishnu. He was born on April 2, 1781, and its celebration coincides with Ram Navami.